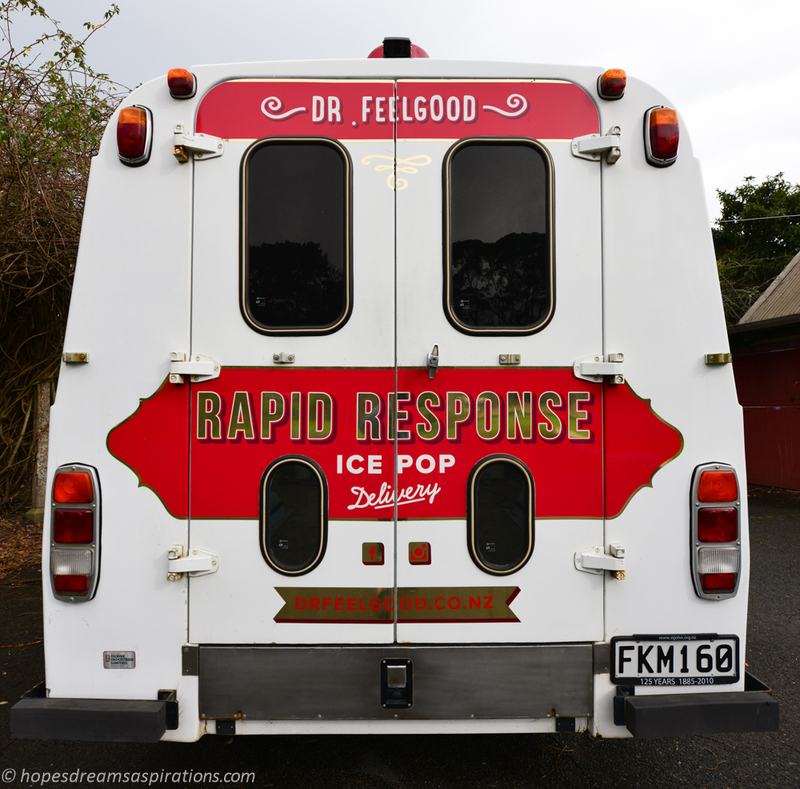 Have you ever wondered how the ice pop brand “Dr Feelgood” came to be? We certainly have. 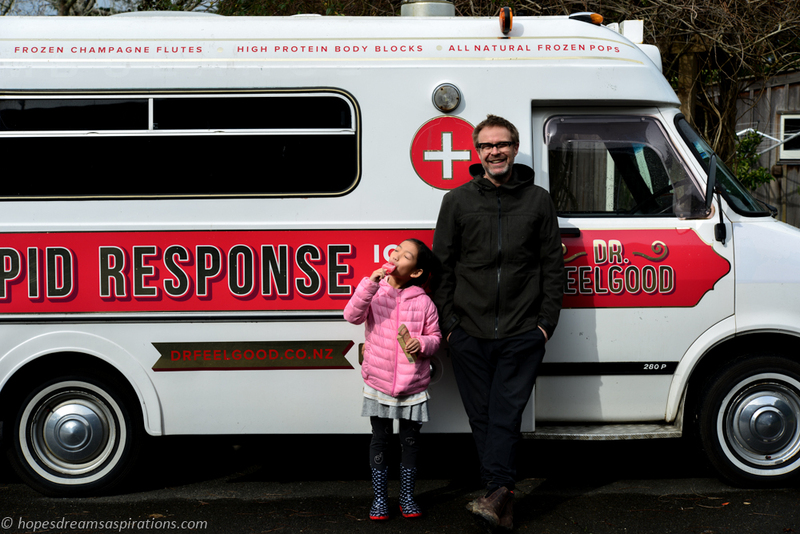 Imagine our excitement when we were invited to tour their workplace and see the operations of the humble ice pop brand that launched into the food scene two and a half years ago. As we drove down the leafy path of their long driveway, passing sheep and horses roaming leisurely around, we wondered how in the middle of the rural countryside, could there be a magical ice pop factory? We were greeted by some Arapawa sheep with twin, 3-day-old baby lambs (now go by the name of Thelma and Louise) and a nudge from Louie, the friendly dog of none other than Dr FeelGood himself, or Jacks. With much excitement and curiosity, we geared up for the tour. Not even the downpour could dampen our visit as Jacks spiritedly told their story. It all started with an attempt to make probiotic drinks, mid 2014. They couldn’t keep the drinks stable enough and it was all looking like a destined fail. They were ready to move on, until Mel, his partner, made pops from the drinks for the kids and their new product was born. During early testing, the pops were made in Zoku moulds. Today, they are made on a much larger scale. Master pop maker Jane, who has been with the company from the beginning, showed us how the Chocolate Jelly Tip was made. Jane is meticulous about quality control – sticks were checked for smoothness, and ensured they were lined upright to avoid wastage. We were given the task of inserting wooden sticks to the holders before they were fastened to the ice pop moulds. This was then placed in a large industrial freezer at -30C. “The faster they freeze, the smaller the ice-crystals. 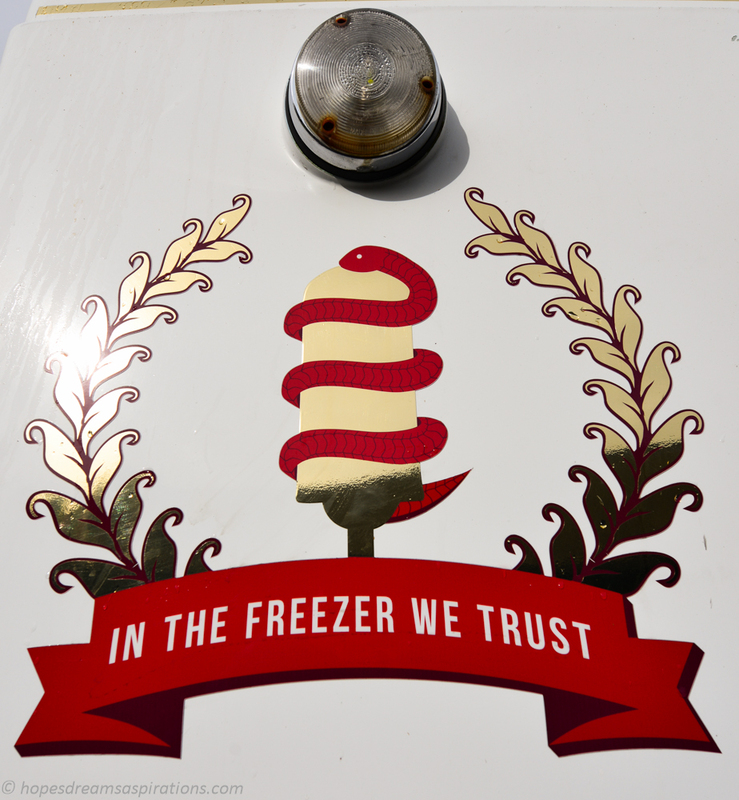 That’s what makes it creamy and delicious.” Jacks told us. Once done, the pops are released from the mould carefully. The sound of that was music to my ears! There were other flavours when the brand started, slowly replaced by the current flavours, always trying for the perfect pop. The first thing that catches your eyes is their colourful design and witty tag lines. I think it’s pure creative genius at work. Both Mel and Jacks have 25 years each in advertising working on brands for others. It was time to try something on their own. Jacks credits the award winning design to his partner Mel Bridge, who has a day job as an award winning commercial director. Together they are building a brand that is gaining popularity with each passing week. When you pick up the pop, there is a certain nostalgic feeling evoked from their brown paper boxes. Something about it brings me back to happy memories of the olden days and some degree of familiarity. 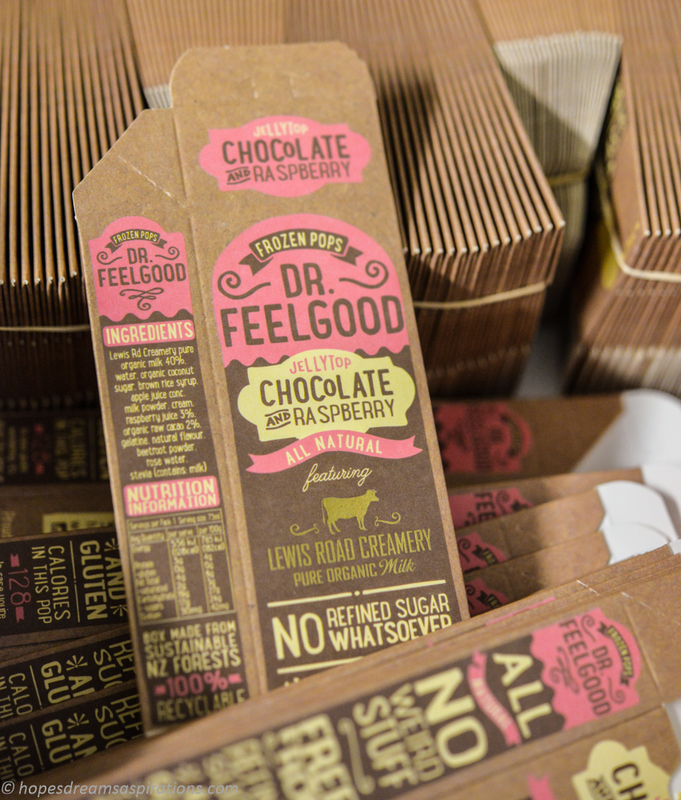 The boxes are made in a local factory, just 3.5km from Dr Feelgood’s factory, with eco-sourced materials that are tracked through the PEFC system (Programme for the Endorsement of Forest Certification, the international non-government organization dedicated to promoting Sustainable Forest Management), making it sustainable and trackable. They are also compostable. These artisan, handmade frozen treats of delight came at a time when people were becoming more aware of food ingredients and eschewing foods with refined sugar. New Zealand ingredients are used as much as possible. Organic milk from Lewis Road Creamery, the premium dairy company that has grown a cult following is used for all dairy pops. The creaminess is just beyond exceptional. 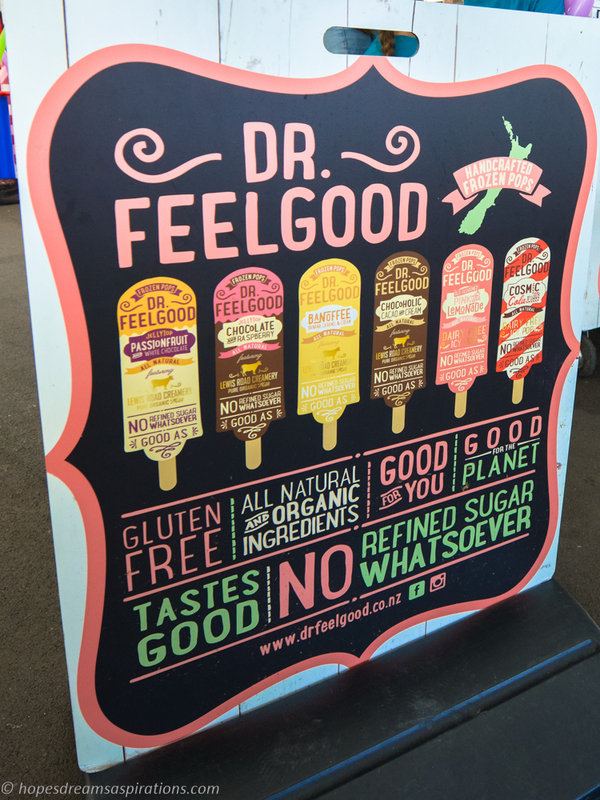 You will not find refined sugar, artificial flavourings or colourings in the frozen pops. Instead, natural sweeteners such as coconut sugar and brown rice syrup are used. Beetroot powder is used for colour. Everything is kept as close to nature as possible. Just like the natural, rural setting we found ourselves in. This premium product is stocked far and wide: Farro Fresh, Moore Wilsons, an ever growing number of New World and Countdowns, select stores in the South Island and some Four Squares. They are also in places like the Waitakere Arataki Visitor Center and Shot Over Jet, Queenstown. Jacks’ passion and creativity is infectious. It is obvious to us on our short visit that he loves his product and is proud to have created a sweet treat that doesn’t invoke guilt. In fact, I am no longer surprised by the rural nature of their creative space; it is precisely that which is the source of inspiration for the all natural, “no weird stuff” pops. Now the only thing to do is to choose which flavour to lick first.